Not my favorite subject today, I’m not gonna lie to you. On January 26, 2018 the American stock market made the final top in the Grand Supercycle bull market that began in 1784. The previous top of similar degree occurred in 1720. England was the hegemon of that era, and her financial, political and social underpinnings failed her, resulting in a 100% collapse in the financial markets, and the failure of the Bank of England, in a bear market that crashed into 1722, resulting in a depression that persisted for sixty years until a second bull market emerged. That was the one that just topped. America is the current nominal hegemon, and it doesn’t take much imagination or historical currency to see similarities with England at the inception of the eighteenth century. We might speculate on our nation’s future, given that the bear market just started will doubtless result in the severest imaginable stress on our institutions. Will America retain its position as the most powerful nation in the world? I’ll leave that one for others to noodle over. Right now, I want to state what my studies of Elliott Wave Principle and the analysis of the professionals at Elliott Wave International have as a probabilistic forecast for the next few years. It’s a barn burner. When I pose it to my former colleagues, they want to take me out in the parking lot and shoot me. Not just because it is in their business interest for my views to be wrong, but because they sincerely believe that the stock market is in the path of, as a money manager just put it to a friend of mine, “A hundred year POSITIVE storm for stocks.” Why am I not surprised? As long as I’ve been in the market, they love ’em at the top, and hate ’em when they’re no good (when they should be buying them). The first impulse wave in the new bear market, labeled 1, bottomed on February 9. Since then, the market has been in a corrective wave. Presently, we are labeling the February 27 top as top of wave two. 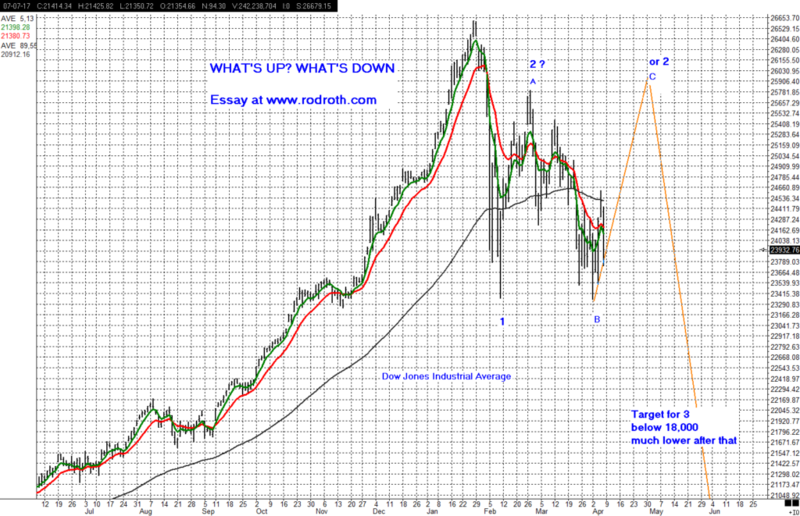 But, as I messaged to my distribution list last week, the abrupt reversal on April 2 presents a second scenario. Instead of a sharp correction preceding the next impulse wave down, there may be another partial retracement, carrying the Dow back up around 26,000 or so before beginning the next impulse wave down. This won’t happen if the Dow breaks below 23,300 soon. Either way, the next wave of selling will be a killer wave, dropping six or seven thousand points. And that’s just the beginning. After a more extended period of consolidation, a steady, persistent decline should take the market into a low below 3,000, which looks right now to occur in about 2021, give or take year. If you haven’t been exposed to the Wave Principal, you will naturally want to know what is going to make this collapse happen. The short answer is that the market’s ebb and flow reflect the natural rhythm of human social life, so the reasons are endogenous, not exogenous. In fact, the crash in the market will be accompanied by a range of other social calamities. They are all interconnected. In another essay, I’ll present The Socionomic Theory of Finance, in which the arguments are defended. For now, I want it known that I don’t make recommendations. What you do with this information is your business. As I said, this is a forecast based on probability. My own presentiment is that the odds are high enough that Cindy and I will hold 100% cash equivalents (T Bills and short term T Notes) in investment accounts until a good bottom comes along.